Tooth resorption occurs when an animal's tooth is attacked by its own body and undergoes disintegration. Tooth resorption usually originates below the gum line, but is not visualized until it spreads to above the gum line. This condition occurs in many animal species, but most commonly in cats. 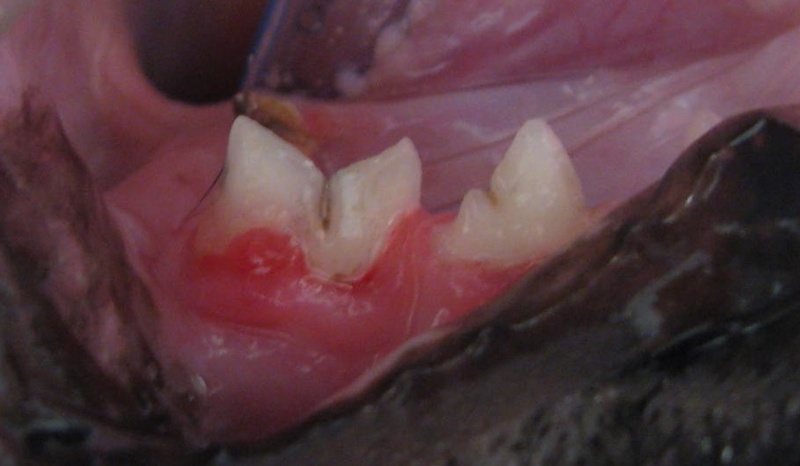 Tooth resorption in cats was previously called feline odontoclastic resorptive lesions (FORLs), cervical line lesion, neck lesions, and feline caries. In the feline, the most common teeth affected with resorption are the upper fourth premolars, the lower third premolars, and the lower first molars. Although multiple theories have been proposed, the cause of tooth resorption is unknown. It is important to note that this process is very different than what happens with caries (cavities) which are caused by bacteria. Proposed causes that have been investigated include viral and bacterial disease, nutrition, and hereditary and environmental influences. Detailed examination and dental radiographs (x-rays) are the best way to diagnose tooth resorption. Sometimes, resorptive lesions are obvious with visual examination. A red, fleshy lesion at the gum line (seen above left) or degradation on the tooth itself can sometimes be seen on visual exam. However, when tooth resorption is below the gum line, dental radiographs are necessary to diagnose the location and type of resorption. 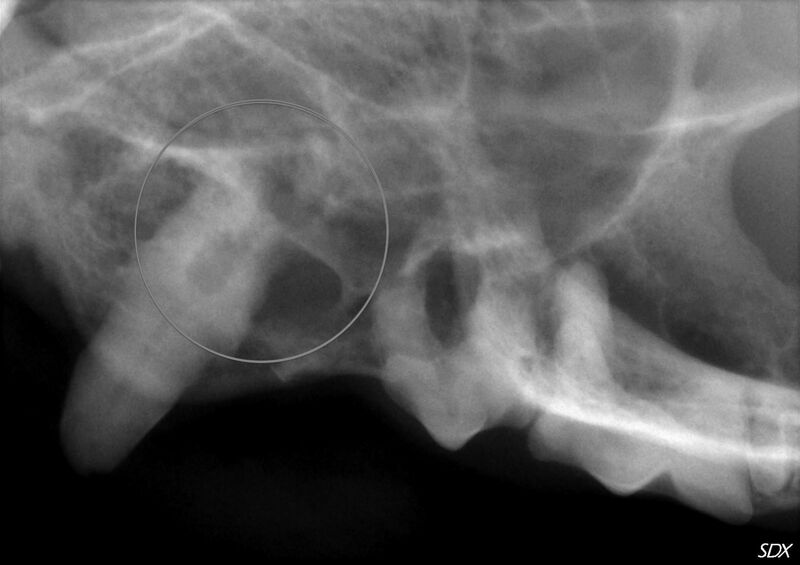 Pictured to the left, a cat tooth shows resorption of the tooth root (circled) only on x-rays. The tooth otherwise appeared normal. Treatment depends on the type, severity, and location of the resorption. Regardless, treatment is aimed at removing the source of pain that occurs during the resorptive process. Previously, treatment involved sealing the lesion with a restorative (i.e. a “filling”); this approach has greatly fallen out of favor since it does not address the source of the resorption and long-term studies show high failure rates. In most cases, extraction of the affected tooth is the treatment of choice, as this will most predictably eliminate the patient’s discomfort. However in some forms of tooth resorption, part of the tooth root will be incorporated into the surrounding bone; this is termed bone replacement resorption. In these patients, only a portion of the tooth can be extracted, while the remainder is left to continue to turn into bone. This procedure is called crown amputation with intentional root retention, and should only be performed after dental x-ray diagnostics.